Where do I start withe my review of the Prince Beast XP tennis string?? It’s hard to write a review on such a great polyester string! When this string first came out, I was a little skeptical of the “thermo construction” Prince was pitching to their consumers. I was also a little worried about the color, I mean, who wants a green tennis string (mind you, John Isner uses a red tennis string) on their tennis racquet? Now that I’ve tested it, I do! I strung up a Donnay X-Dark Red 94 with the Prince Beast XP at 52 pounds of tension – following the instructions given to me by a Prince distributor ‘string this string several pounds lighter’. The stringability of the Beast XP was a little challenging, because it is a stiffer poly, the coil effect lingered after I pre-stretched, so running the crosses was a little annoying, but finishing the knots was a snap and off I went. I started off with some casual volleys, just to warm up a bit, then I took it back to the baseline for some groundies. As soon as I was warmed up and started hitting 100%, I was floored at how powerful the Prince Beast XP really felt. Not only was it powerful, I had some additional and unexpected control off the ground and volleys were exceptional with drop and put aways. Every time the ball made contact with the string, it really felt like the ball was getting a nice little “hug” from the stringbed, also known as ball pocketing, spinning deep to the other side of the court. There’s that knowledge that a freshly strung tennis racquet will lose anywhere from 4 to 6 pounds of tension within the first hour of use, to be honest, the Prince Beast XP didn’t feel like it lost more than 1 pound, if not less. 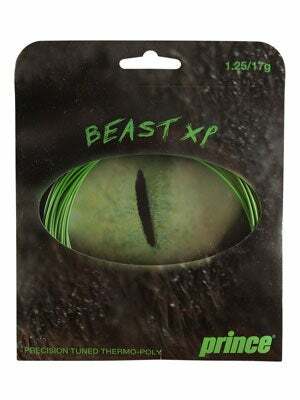 I do recommend Prince Beast XP for any level player, however; word to the novice tennis player, this is a stiff tennis string. The string will make your arm sore if you do not have the strength to handle the impact your arm will endure during play. It’s a great string with great durability, spin, and feel.